Once a month I take a trip to the farmer’s market where I purchase meat from the butcher and fresh fruits and vegetables. I get roughly enough to last for a month and freeze it in meal-size portions for my family of five. I shop in season so I get a good price on the fruits and vegetables I buy, allowing me to store things like peppers, carrots, and rhubarb for the colder months. I purchase bulk meat plans from the butcher so I can get a bit more for my money. In every place I shop, the owners often throw in a few extras as a thank you. A few spare peaches or potatoes, sometimes an extra steak. 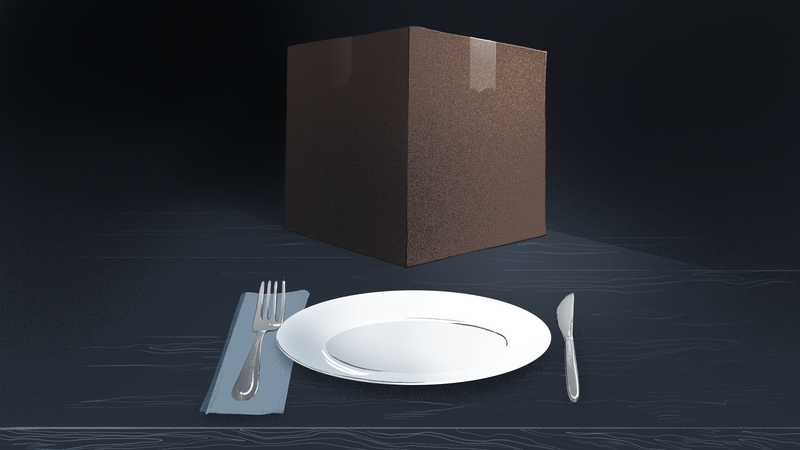 These boxes have been described by Office of Management and Budget director Mick Mulvaney as akin to “Blue Apron.” But unlike that company—which supplies fresh ingredients for individual meals, chosen by you, straight to your door—these boxes will contain preselected, shelf-stable items like pasta and cereal as well as canned meat, fruits, and vegetables. Because as we know, all anyone needs to survive is peanut butter and dry goods. Let’s call this new proposal what it is: Rations for the poor. Some have suggested this idea was never viable in the first place, and wasn’t meant to be. But the fact that the White House would even propose these Harvest Boxes has made clear that they’re not the least bit concerned about what families like mine actually need. For us, the SNAP program is working how it should. The myth of the abuse of food stamps has been kept alive for decades, from the “welfare queen” of the 1980s to the recent obsession with SNAP recipients buying nothing but steak and lobster. Although I do buy steak, mostly I am thinking about procuring food that will meet the needs of my family. That doesn’t include a diet of lobsters and truffles. And yes, we do eat some shelf-stable foods. Pasta and cereal are household favorites. We keep some canned vegetables for emergency meals and canned fruit for quick snacks. Of course we have peanut butter and beans in our diet. But supplying these items isn’t $200 worth of my monthly food budget. I go to low-cost groceries and buy these in bulk. I spend maybe $100 monthly to fill my shelves with pasta, cereals, beans, flour, rice, sugar, and spices. Although we may have to purchase some odds and ends every month like milk and butter, our current use of food stamps allows us the flexibility to bypass the reliance on higher-priced local, urban grocers and fill our house with the food we need to feed our family. The bulk of our benefits go to local farmers and butchers. I happen to live in an area close to more rural locations, which allows me easy access to these foods, and I have a chest freezer to store large amounts of food in, which is good because my children are growing like weeds. This is a privilege I know not everyone has, but that’s the point: Different families across the country have different needs. Some families, for instance, must worry about severe allergies. Others might need high-calorie foods or may eat vegetarian or vegan. And there are other quirks that aren’t captured on an application. My children are homeschooled. That means my grocery budget must support feeding five people for three meals a day, plus two snacks. Usually, school-aged children eat at least one meal outside the home, but my children eat every meal here. So do I. So does my husband. I shouldn’t even have to write this essay defending the food choices I make for my family. The way I shop to feed my family now is both affordable and healthy. We are provided with fresh fruits, meats, and vegetables to prepare balanced and filling meals that work with our lifestyle needs. It allows me to plan for big meals with ingredients that reheat well while also providing the children with some simple items they can make themselves. For us, the SNAP program is working how it should. Rations like these would make feeding my family needlessly more difficult and change our diet from one brimming with fresh local foods to one that is full of shelf-stable crap shipped from who-knows-where. This plan wouldn’t just replace my family’s meals with lesser products, it takes away freedom of choice—a principle Republicans have held dear in the past. For some reason, this administration seems to think that we, the poor masses, cannot make any choices on our own, otherwise we’d probably choose not to be in need. I shouldn’t even have to write this essay defending the food choices I make for my family. I shouldn’t have to justify if we sometimes have frozen chicken nuggets for dinner instead of a farm fresh meal. And people who don’t have the option of fresh foods because they live in food deserts shouldn’t have to justify how they eat, either. It is no one’s business what anyone is eating, or how or why. And this proposal is just one more way to regulate and infantilize the people who need help. Conservatives will tell you this is simply an attempt to make room in the budget, and administration insiders have admitted this is all part of a larger strategy to indicate Republicans’ intent to further cut food programs. But when I think of the logistical and financial nightmare of delivering boxes of food to millions of poor Americans, it’s easy to see this proposal for what it is: nothing more than a deliberate, contemptuous attack on poor people, and a way to punish them by controlling their lives. Donyae Coles is a healing justice and technology writer. You can follow her on Twitter @okokno, Facebook, or her personal blog, www.freenightsandweekends.org.